↑ Ukraine’s Defense Ministry elaborates on military reserve], 29/11/2018. 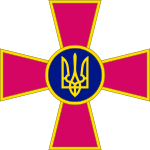 "London, UK-based Institute for Strategic Studies appraises Ukrainian Armed Forces' personnel as 295,500-strong". Ukrinform. 2003-10-25. Information on Ukrainian army resources (both human and weapons). หน้านี้แก้ไขล่าสุดเมื่อวันที่ 29 พฤศจิกายน 2561 เวลา 11:26 น.